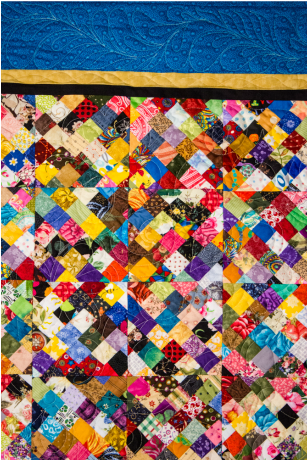 This quilt is composed of the scraps and left-over materials from the Pro-life Prayer Pillows made in 2015-2016. Sewn by: Barbara Warner, Janet Presser and Milli Suiter of St. James Parish in Omaha, NE and Mitzi LeClair of St. Phillip Neri Parish in Omaha, NE. Quilted by: Jen Schechinger of Norfolk, NE. *Proceeds from the quilt raffle will go directly back into Heart of a Child Ministries so that we can continue to create Pro-life Prayer Pillows, spread prayer to end abortion, awareness about the gift of the child, and deliver our important pro-life, pro-family educational mission in schools, youth groups and PRE classes throughout the archdiocese. 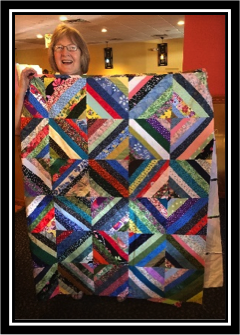 Below are photos of the first quilt and matching pillow made from scraps of fabric from the first three years of making the Pro-life Prayer Pillows. There are over 6,000 fabric squares in this quilt. 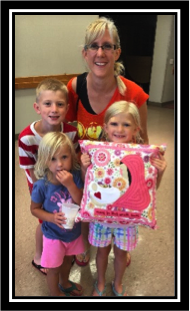 Each year Heart of a Child Ministries hopes to create a quilt from the fabric of prayer pillows made that year. For 2016, the St James Parish Quilting Group is creating the quilt. Quilt will be raffled off at the end of the year. 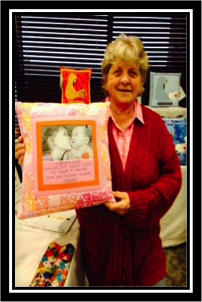 Proceeds will help us to continue creating Pro-life Prayer Pillows.